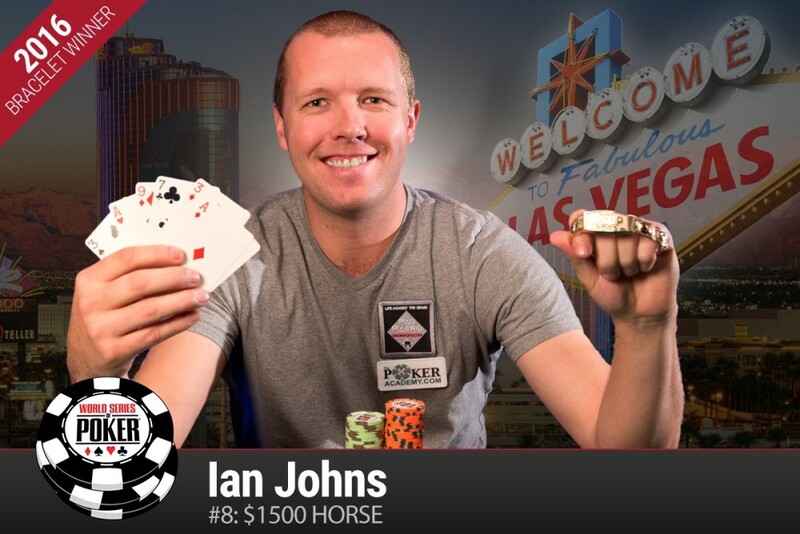 Ian Johns is the newest member of poker’s gold bracelet club. This marked his second career victory following his debut victory ten years ago. That came in a Limit Hold’em event at the 2006 WSOP. Ten years later, the poker pro originally from Newcastle, WA won the $1,500 buy-in H.O.R.S.E. tournament, which was played over three days and nights at the Rio in Las Vegas. Johns collected $212,604 in prize money, making this one of the biggest wins of his career. Amazingly, he was dead last in chips at the end of Day One – ranked 201st out of 201 survivors. That was just but one of three comebacks Johns would make in this tourney. The third lightning strike occurred late in the tournament and at the perfect time. Just when it looked like Justin Bonomo was about to pull away and win what would have been his second gold bracelet, Johns dug in and managed to win a key hand, reversing the table momentum. Johns won his victory by conquering a final table which included six past gold bracelet winners – including himself, Justin Bonomo, Georgios Sotiropoulos, Andre Akkari, Svetlana Gromenkova, and Scotty Nguyen. After a fierce heads-up battle during which both players had sizable chip leads at various points, the limits became so high (36 big bets total in chips on the table between both players) that a couple of hands played to the conclusion could swing the final decision in one players favor. The ultimate moment of triumph came when Johns scooped the final pot of the tournament, against Justin Bonomo, who finished as the runner up. Interestingly, Johns and Bonomo had a long history of playing together, dating back more than ten years. They often faced each other online. As for his poker career, Johns splits his time between living in Las Vegas, where he plays poker full time, and Seattle, WA which he still calls his hometown. In fact, Johns was cheered to victory by a large rail which included several other poker players who were natives of the Seattle area, most notably Jeff Shulman and Rep Porter. Johns is a Limit Hold’em specialist. He mostly plays $80-160 limit cash games. However, he also tries to play as many Limit Hold’em tournaments as he can, and ventures into Mixed Game formats such as H.O.R.S.E. on occasion. He finished tenth in last year’s $10K buy-in Limit Hold’em Championship. He finished 17th twice in that same event, as well, even more proof of his Limit prowess. This tourney attracted 778 players which created a prize pool totaling $1,050,300. The top 117 finishers collected a payout. H.O.R.S.E. has been a staple of the WSOP over the past 15 years. It’s a mix of five standard poker games, including Hold’em, Ohama High-Low Split, Razz, Seven-Card Stud, and Stud Eight-or-Better. Mixed game tournaments have expanded substantially in recent years. However, H.O.R.S.E. was the original multi-game format intended to test competitors in a broader spectrum of poker variants. H.O.R.S.E. remains the format used to determine the Poker Players Champion, now in its 11th year. Second Place: Justin Bonomo, the well-known poker pro who earned his gold bracelet two years ago in a Six-Handed No-Limit Hold’em event, finished as the runner up. He pocketed $131,412. Amazingly, this was his seventh time to make the top three in a WSOP gold bracelet event. Bonomo now has 35 career cashes and more than $2.7 million in WSOP-related earnings. Third Place: Christopher Vitch, from La Jolla, CA added to his tournament resume with a fourth WSOP final table appearance, including what amounts to three top-3 finishes, by finishing third. Vitch collected $92,374 in prize money. He’s cashed at least once every year since 2010. Fourth Place: Noah Bronstein, from Kirkland, WA came in fourth. This was his 31st time to cash at the WSOP, which paid out $65,866. Fifth Place: Georgios Sotiropoulos, from Farrell, Greece won a gold bracelet last year at WSOP-Europe. All of his 11 cashes have occurred since 2014. The player who was born on the island of Rhodes (Greece) rode off with $47,651 for a nice effort. Sixth Place: Andre Akkari, from Sao Paulo, Brazil became the second Brazilian gold bracelet winner in 2011. One of South America’s most popular players, Akkari now has 20 series cashes. The $34,984 in prize money he collected puts him closer to $1 million in career WSOP earnings. Seventh Place: Svetlana Gromenkova, from New York, NY took seventh place, which paid $26,070. She won the 2008 Ladies World Championship and now has three cashes this year, and 17 in-the-money finishes at the WSOP. She was the third female to make it to a final table at this year’s series. Eighth Place: Scotty Nguyen, a four-time gold bracelet winner and the 1998 world poker champion, rounded out the final table as the eighth-place finisher. This marked his 52nd time to cash. The $19,724 paid out to Nguyen for this finish adds to his $5.2 million in lifetime earnings at the WSOP. This was the 8th event on this year’s schedule. That leaves 61 tournaments still to go at the 2016 WSOP.